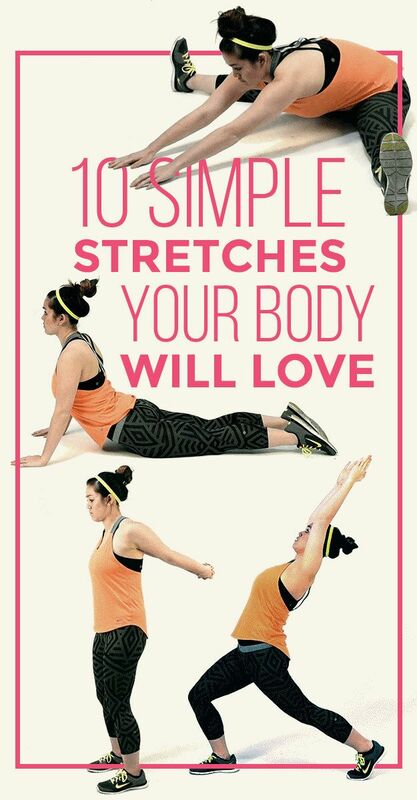 BuzzFeed Life spoke with personal trainer Mary Jane Detroyer, M.S., R.D., C.D.N., who recommended these 10 easy stretches. She says they’ll help reduce muscle soreness, lower your stress, and minimize your risk of injury, while improving athletic function and performance. Pretty great. The best part: You can do these stretches anytime you need to, and pretty much anywhere. Just make sure that you ease into them slowly if you haven’t already warmed up, so you don’t hurt yourself. Also if any of this is painful, you either shouldn’t stretch as deeply or you should stop doing the stretch altogether. Feeling stiff is normal, and some people will be more flexible than others. But you want this to feel good, not bad.